NASA is celebrating Independence Day this year by putting a spacecraft into orbit around Jupiter. The space agency’s Juno mission is slated to arrive at the massive planet on the night of July 4th, after having traveled across more than 1.7 billion miles of space over the past five years. Once Juno arrives, the probe’s main engine will fire, slowing the spacecraft down and placing it into orbit around Jupiter. It’s an important event for the mission, especially since NASA has only one shot at getting it right. If Juno flies past Jupiter, the mission will be blown. That science involves studying the amount of water in Jupiter’s atmosphere, as well as mapping the planet’s huge magnetic field. Juno will also study Jupiter’s gravity to figure out if a dense core lurks deep underneath. All of that information will help NASA deconstruct the origins and history of the solar system’s largest planet. Scientists have a lot of theories about how Jupiter formed and how it got into its current orbit, but Juno’s data will help researchers strengthen our understanding of where Jupiter came from. And that will ultimately tell us how the rest of the planets formed—including our own. In order for NASA to get these answers, Juno has to get into the right orbit around Jupiter first. And it’s not going to be a simple, circular path like the Moon takes around Earth. Juno’s orbit will be highly elliptical, taking the spacecraft super close to Jupiter’s poles for just a few hours and then way out into space for two weeks at a time. It may seem like an inefficient way to orbit the planet, but it’s crucial for keeping the spacecraft alive. The area around Jupiter isn’t a very inviting place. The planet is surrounded by a large magnetic field, thought to be generated by a swirling ocean of liquid metallic hydrogen located deep underneath the planet’s surface. The motion of this conductive material produces an electric current, ultimately creating a magnetic field known as the magnetosphere that’s 20 times stronger than the magnetic field of Earth. This magnetosphere extends out millions of miles around Jupiter, making it the “the biggest entity in the solar system,” according to Scott Bolton, Juno’s principal investigator. 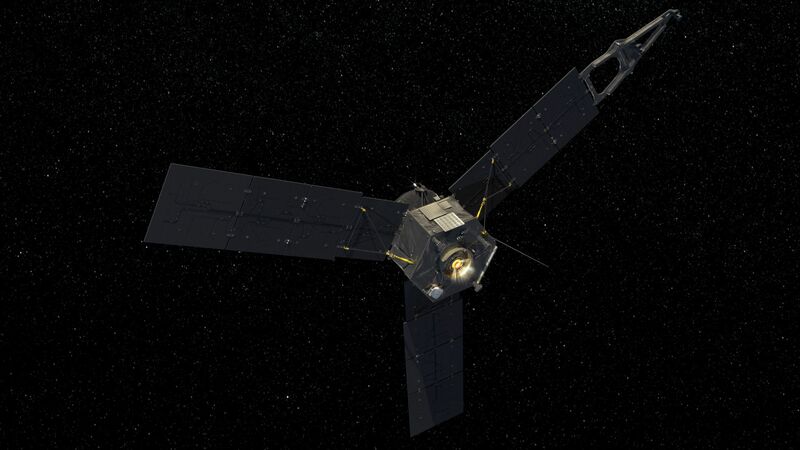 Juno’s unusual orbit will basically help the spacecraft avoid getting fried. The radiation belts are shaped a bit like giant donuts stemming from Jupiter’s equator, but they’re not as strong at the planet’s poles. So each time Juno approaches the planet during orbit, the spacecraft will come in over the north pole and then dive in really close to Jupiter at the equator—going in between the radiation belts and the planet. Juno will then swoop away from Jupiter over the south pole and continue on out into space for a while before looping back toward the planet again. This close approach to Jupiter is known as a Perijove pass. Juno will spend most of its orbiting time far away from Jupiter, and will only collect data for about six hours during each Perijove pass. It’s not a super long time, but this path brings Juno within about 2,600 miles of Jupiter. That’s pretty close, considering the planet itself is more than 86,000 miles in diameter. Juno will be traveling at more than 40 miles per second when it reaches Jupiter on the Fourth. At that point, the spacecraft’s main engine will burn for about 35 minutes — long enough to slow the vehicle down by 1,200 miles per hour and allow it to be captured by Jupiter’s gravitational pull. This will put Juno into an initial orbit that lasts 53 days. Plus, the spacecraft will be all on its own out there. It takes about an hour to get a radio signal from Jupiter to Earth, and Juno has only about 20 to 30 minutes to insert itself into orbit. The spacecraft has backup systems to help it restart if something goes wrong, but if there is a failure, NASA won’t have enough time to send any corrective signals from Earth. 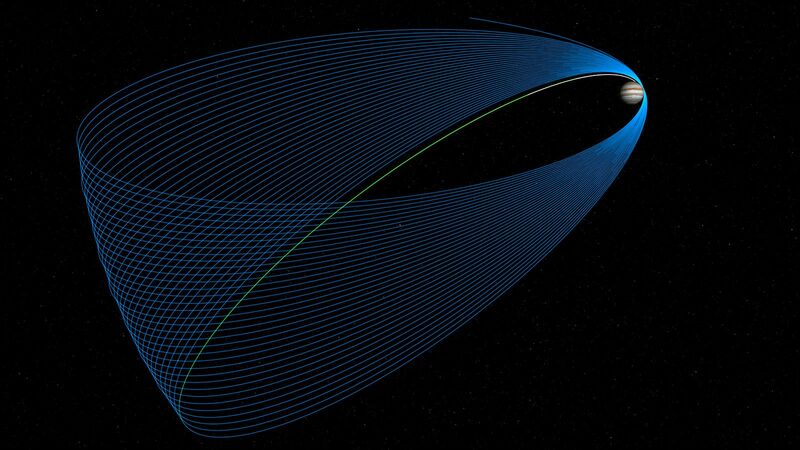 “So [orbital insertion] is kind of a nail biter for us, just because it’s so important to us, and the spacecraft has to do it all on its own,” said Levin. NASA will receive confirmation that Juno’s engine has started burning at 11:18PM ET on July 4th, and then know if the burn has been successful just before midnight. Juno won’t do much science during its initial 53-day orbit, but at the end of its first loop on August 27th, Juno will make its close approach to Jupiter and get its first good look at the planet with all of its instruments on. That’s also when the first close-up pictures will be taken from the probe’s onboard camera, JunoCam. After that, the spacecraft will make another 53-day orbit and conduct another Perijove pass starting on October 19th. That same day the spacecraft’s engine will burn again, helping to place the probe into a shorter two-week orbit. Overall, Juno will complete 32 orbits around Jupiter before its mission is over. Juno is in a constant state of spin, rotating three times per minute. That way, the spacecraft’s nine instruments will point at Jupiter 400 times as Juno flies from pole to pole, peering inside the planet and learning more about its early history. A leading theory is that Jupiter formed from huge chunks of ice and other debris super far away from where the planet is now at the fringes of the solar system. These chunks clumped together to become a dense core that had enough gravity to pull in gases and other heavier elements. Then, the planet eventually migrated toward the Sun to settle where it is now. Another theory says that Jupiter formed exactly where it is now from the gas and dust leftover from the formation of the Sun. These gases may have clumped together, becoming dense enough to pull in other gases and materials to form into a planet. Both origin stories are plausible, but Juno will help NASA determine which theory makes the most sense. 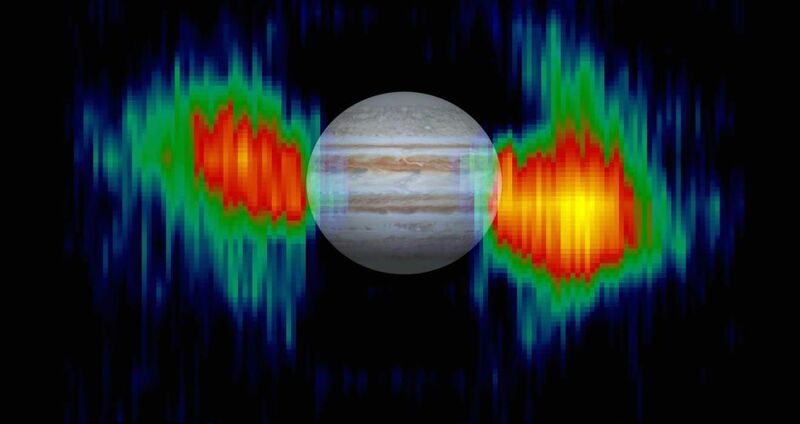 A way of doing that is studying how much water is in Jupiter’s atmosphere. Microwave radiometers on board will be able to look for the amount of H20 inside the planet’s hydrogen and helium clouds, telling researchers a lot about how and where Jupiter formed. “If it formed really far from the Sun where it’s very cold,” said Levin, “then the other materials that were carried in with the water will have carried in more stuff. If it formed closer to the Sun, where the water is not as cold, [then] other materials did not stick to it as well.” And if Jupiter didn’t form from pieces of ice at all, then Juno won’t find as much water as predicted. Another big point of study is Jupiter’s potential core. 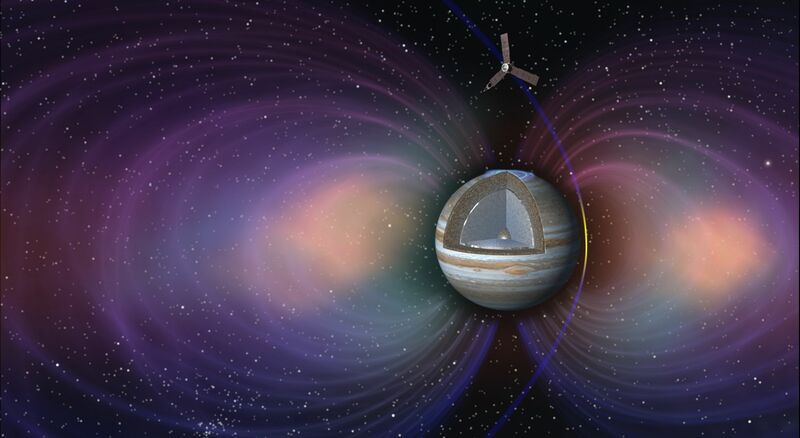 Juno will be measuring the planet’s magnetic field and gravitational field to determine if a dense core lies underneath all of Jupiter’s circulating gases and liquids. It’s possible that such a core is rocky—or made of materials that make up rock—but it won’t look like any rocks here on Earth. “It’s not going to look like a piece of granite,” said Levin. “Remember that it’s going to be at tens of millions of times the pressure here on the Earth. We don’t really know how materials behave at those very high pressures.” If a core is present, that supports the idea that the planet formed from large ice chunks and indicates there are a lot of heavier elements inside. Why were the Russian Facebook ads so strange?